Another easy way of saving money is to avoid buying cooked food. In some countries it’s almost cheaper to eat out than cook yourself but not everywhere else. Other places there are no options for buying food! At times I’ve had to carry food for a few days at a time. I carry a gas cooker. I bought it because it was the first one in the shop and I had no idea there was different types of cookers. Gas is great – it’s often very cheap, it’s fast to start up, it burns clean and the flame is adjustable. 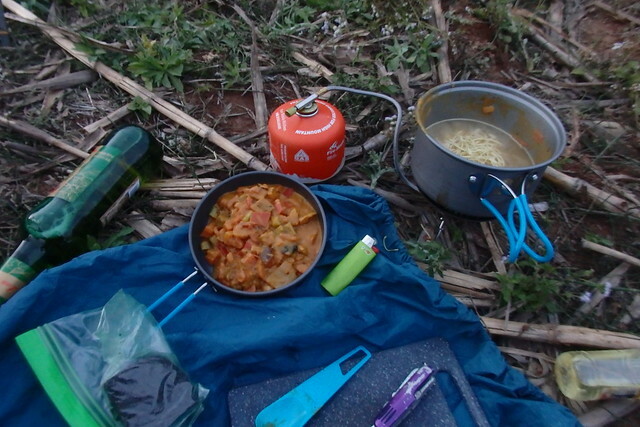 Because it’s easy to control I find it easy to cook with indoors (and even in my tent, which I did when it was raining or in Australia when there were too many bush flies). Burning liquid fuel is more fiddly – it doesn’t burn clean so you need to maintain your stove and they take longer to start up. There is a reason why most cyclists leaving the ‘developed world’ take multi-fuel burners. Petrol can be found anywhere in the word and different fuel can always be sourced for cheap. Gas canisters can not be found everywhere. As much as I prefer it, were I to do this trip again I would probably take a multi-fuel burner. With a bit of planning gas is workable. The canisters are easy to find in Europe and Turkey. The more expensive camping stores in Iran stocked them and it was possible to find them in the capital cities in Central Asia. The bigger towns also had them in China but in South East Asia it was a more difficult. I bought a couple canisters in Chiang Mai, Thailand but in Indonesia they are non-existent. That was the only part of the world I ran into real trouble relying on gas. In Indonesia you can buy the long ‘cylinder’ type canisters. 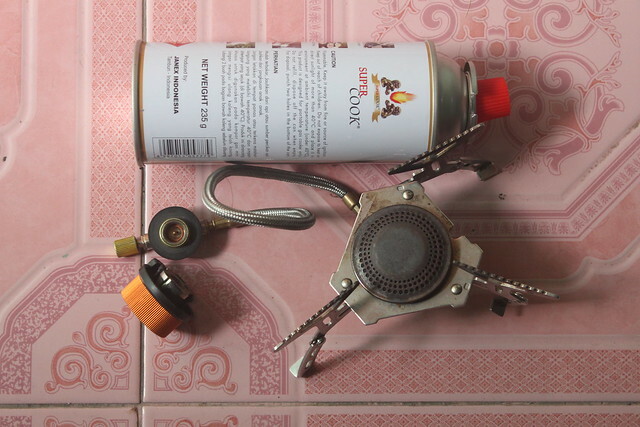 If your stove has an adapter for both you’re in luck (this type of canister can also be bought in much of the world and they are cheaper too). I bought an adapter like this (pictured below), and I got through Indonesia and East Timor without starving. Those adapters are usually DIY ‘non-official) tools and my one leaks a worrying amount of gas. It was great to have as a back up but not for permanent use. Doing this route as a pair would be a nightmare with gas canisters but solo it is doable. A double size can usually lasts me 3 weeks cooking a couple meals a day so I can easily carry a couple months of supply should I really need to. There are stoves like the Primus Omnifuel that can burn both gas and liquid. I would look into one of these were I to do a tour like this again. When gas canisters are cheap (they cost just £2-3 for the usual size ones in many countries) they are the clear winner but it is nice to be able to burn petrol when the canisters are unavailable or too expensive. Strong cup of coffee through the drip filter. I’m too much of a snob to drink instant coffee. If I can buy a tube of sweetened condensed milk I squirt a dollop of that in (I prefer it to milk powder). If it’s available I like to have a bowl of muesli in milk (from powder). Always a piece of fruit or two chopped up in it. I find muesli burns slower than anything else. If it’s cold I eat porridge. 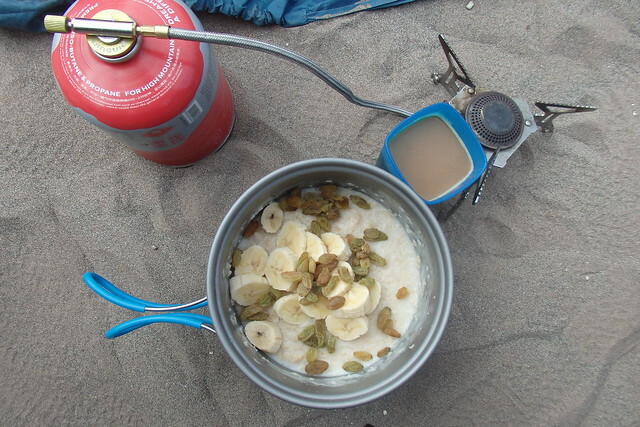 Oats are available almost everywhere in the world. Quick cook ones are my favourite. Bread and spread when I’m lazy. Peanut butter with banana or jam if I have the jars. I’m usually too lazy to cook lunch. Bread with bits and bobs: cheese, tomatoes, cucumbers, peppers, salami, jam etc. Depends what’s available at the local market. In countries where there is no bread (China and SE Asia) I would normally cook a large meal with rice, eat half of it and save the rest for dinner. In China and SE Asia food was super cheap (easy to get a meal for less than £1) so I would often buy lunch. Usually rice or pasta with a cooked sauce. Tomatoes and whatever veggies are in season. Milk powder is good for thickening and peanut butter for an easy peanut curry. I have a few film canisters filled with spices to get creative with. I always carry a couple packets of instant noodles for when I run out of time or am too lazy. I hate instant noodles but often eat them when it’s too cold to cook or too hot to carry fresh food. These are the things that are usually in my food bag: coffee, milk powder/sweetened condensed milk, muesli or porridge, bread, jam/peanut butter/nutella, rice, pasta, fruit (whatever is in season and lots of it! ), tomatoes and cucumber, vegetables for dinner (I never cook meat), spices in film canisters, olive oil (for cooking and salads), biscuits, dried fruit and peanuts. It varies a great deal from place to place. E.g. I ate lots of dates and other dried fruit in Iran, stuffed buns in China and sticky rice in SE Asia. One of the things I enjoy most is shopping in local bazaars and buying from roadside vendors. Luckily a lot of the world has a cheap eating culture that doesn’t exist in the UK. 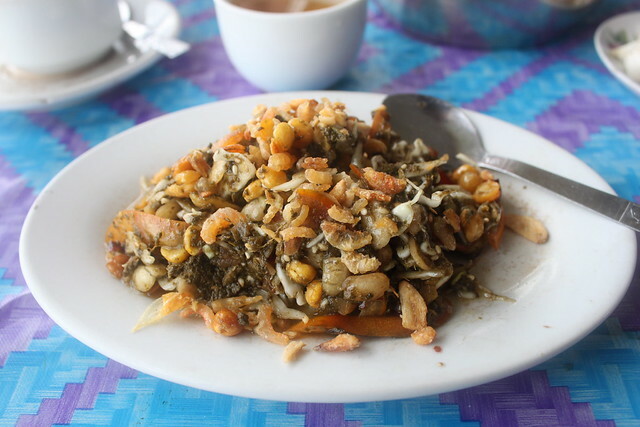 This didn’t really occur to me until I reached Central Asia – until then I almost never bought cooked food. I probably missed out on a lot of good stuff but I also saved money! Picnics from Lidl in Europe, kebabs in the evenings, fresh bread and sujuk sausages in Turkey, somsa pastries in Central Asia, plov for lunch and laghman for dinner, baozer for breakfast in China and noodle soup for lunch, tea leaf salads in Myanmar and peanut dishes in Indonesia. Fueling my body around the world has been a pleasure!